SF Taxi Media: SF Taxi Driver Suffers Stroke While Driving His Taxi, Then Dies. Fellow Drivers Offer Money For His Burial. By John Han. SF Taxi Driver Suffers Stroke While Driving His Taxi, Then Dies. Fellow Drivers Offer Money For His Burial. By John Han. On July 6, 2011, San Francisco taxi driver Barbajide R. Odeboju, (AKA - Richard Odeboju), was admitted into the hospital after suffering from a stoke, which allegedly occurred while driving a taxi. 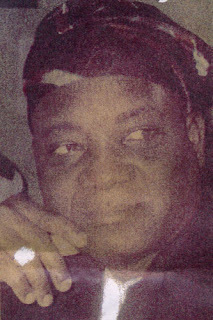 Odeboju, who was 58 years old, was Nigerian born and had resided in Oakland for at least 25 years. He is said to have no next of kin in the United States. According to California Pacific Medical Center (CPMC) records, Odeboju was taken by ambulance to CPMC's Davies Campus at 45 Castro St. in San Francisco. He stayed there in the hospital until he passed away eleven days later on the 17th. Stroke is listed as the "immediate cause" of passing away, according to public record, although an autopsy wasn't performed. In addition to, or aside from the facts so far, the following is an interpretation of an account that was offered to Taxi TownSF by Yellow Cab taxi driver Tariq Mehmood, regarding Mr. Odeboju's passing. Mr. Odeboju was driving his taxi shift. His cab was seen weaving on the road. [It is thought that this occurred along HWY 101, but it is not been verified by the SFPD or by the Highway Patrol]. A police officer pulled him over. But when the officer approached the driver's window, he found Odeboju with his head on the steering wheel, incognizant. He was taken to the hospital where he stayed unable to speak, and then died approximately two weeks later. Odeboju has no next of kin in the country. Funeral arrangements have been made with money raised by fellow cab drivers and the Nigerian Community. "He was rushed to the hospital where he remained unable to speak for 2 weeks and then passed away. Since he got no family here, his body was suppose to be dealt in the manner as the City does with such bodies. But [a] few taxi drivers decided to collect funds and arrange his proper funeral. In the meantime, efforts were made to bring her daughter from Nigeria so she can attend her father funeral but she was denied visa in spite of assurance given to the embassy by Tariq Mehmood and other drivers to cover her trip expense and her return back to Nigeria." Mehmood says that he had lead an effort to raise money from fellow cab drivers to pay for funeral services. He says that with the money raised, combined with money raised by the Nigerian community, services have been paid for. A viewing and service is scheduled for Saturday, October 1st, 2011, from 11am - 1pm, at Thompson Bay View Mortuary, at 9900 International Blvd. in Oakland. Odeboju's body is arranged to be buried the same day at Valley Home Memorial Park, at 30705 Lone Tree Road, Oakdale, Ca., 1pm - 4pm. I think it would be a good idea to investigate the cabs he has been driving. As many of you know I have been in cabs that are believed to be leaking carbon monoxide in the cab. I am not a doctor but maybe he was exposed to elements that he should not have been while driving a taxi that could have contributed to his death. With medical coverage this tragedy might have been avoided. Mr. Odeboju might still be alive but for the shoddy and shameful treatment cab drivers are getting. We have no medical coverage, indeed no future, and we pay for the MUNI drivers' $500 jackets, that could be bought in any store for a tenth of that. According to law, all cab drivers are supposed to have long since gotten medical coverage. To this day they are already, in fact, paying for it with every shift they drive. But the City allows the companies to quite simply say "no" to obeying the law it created. All persons who knowingly obstruct the implementation of the medical coverage law bear possible responsibility for all deaths of this kind, ON OR OFF THE JOB, indeed drivers' illnesses in general. The cab companies have collected over $50,000,000 thanks to the City's complicity. What tiny fraction of that might have saved Mr. Odeboju's life, by finding his illness in advance? Could not every cab driver's every ailment be treated with less money than that? The cab companies, together with the City, are committing passive acts of murder. The large companies actually spend big money to fight the implementation of plain positive law. Shame on them! Anyone who thinks justice in this country exists only for the wealthy has a reason to think so. WHERE IS OUR PROMISED, LAW-MANDATED MEDICAL COVERAGE? WILLFUL NEGLECT IS A FORM OF CORRUPTION! Me, " independent contractors " ? John, thank you for wounderfull and accurate information to the industry and high standard of journalism you are maintaining in reporting matters. The time you consumed to find out from CPM hospital about the arrival of Mr. Richard by ambulance in the hospital. Then your efforts to go health department and look at Mr. Richard death certificate. Then you asked me that how I got the picture of Mr. Richard which I gave you. I like all this and I wish you should be hired by SFMTA as investigator to keep things straight. Should you have spent this time driving your taxi, you could have made couple of hundred. Thanks for the sacrifice for the taxi community. Your blog is clear of any bluffing, puffing, phony-baloony. In fact you checked on me so well to make sure that each word you are reporting is correct, and I admire you for all that. I wish the others to follow you. So we the few drivers were encouraging others to donate and after spending the day out, we returned back to meet the night drivers after midnight. One homeless person gave me 25 cents and I told him thank you and apparently I do not want him to spent his 25 cents for us. Looking at my face, he said "Don't do that. If you will return my 25 cents you will make me homeless twice". I asked him how come ? He said that giving 25 cents he felt that today onward he is not homeless. When he will dies, someone else will get him proper resting place like we are doing for this taxi driver. I appreciate Dean Clark comments that we need to ask some department for random check on cabs about gas leak. Several time I heard from drivers that they felt gas smell and went dissey. Due to the nature of this industry, no one cares what a driver goes through. It is time to look into it. May be a request to the city Health department to study this problem and do some testing in the cabs at random. Some time back, a gas man who was employee at Yellow passed away and his family lacks funds for proper funeral. I, together with Mr. Roberto who is also Yellow gas man arrange the proper funeral with the help and support of Yellow taxi drivers. Once again one driver child who got Autism needs help to send him for treatment at Miami and kind Roberto with me made effort to arrange expenses for that mission. Roberto is a great guy. It is said that he gave his one Kidney (or another part of body) to one of his family memeber here in the US. Roberto got tons of love and he is distributing not by the grams but by Kilograms. Keep the love going on for all humans. By the way at the end, I would like to mention that I do not handle donation money and I let the others do it except that my presence encourage people to contribute. While I was driving and John your phone call came in to varify some information, I was in the process of dropping a customer (3 people). They heard my talk with you and one pulled out a $ 100 bill to put into this donation but I very politely refused him by stating that I am not going to take any donation from any customer for a taxi driver. Let the drivers do it. Once again thank you John for excellent work. I think strokes and heart attacks more prevalent among cab drivers, I know there was a study done on cab drivers health at UCSF but don't know results of it. Lack of sleep, long shifts sitting which can make clots in legs just like long airplane flights, stress of focusing and dealing all that comes with cab driving, and throw in a bad diet that comes with little time to relax while working leads to these kind of illnesses, I know the lady who used to cut my hairs brother in law was medallion holder who had stroke in early 40's hear about this all the time. one guy recommended eating half and asprin to help blunt the clotting effects. Maybe the City could take us over and we could all become unionized. A MUNI taxi/bus drivers' union could really improve traffic flow in this city. After all, we spend all our time on city streets. Awesome looking website. I recently built mine and I was looking for some ideas for my site and you gave me a few.